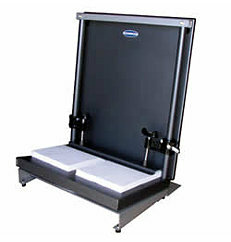 The Challenge Handy Padder is a portable and compact table-top padding device at a great price. The convenient turn style base of the Handy-Padder allows the operator to load, clamp and pad from a single position. The convenient turn style base of the Handy-Padder allows the operator to load, clamp and pad from a single position. With the simple 1-2-3 operation it turns a padding service into a value-added profit center. All you have to do is lock the removable plate in place and the 8° table slant allows gravity to do all the work of aligning stock and keeping it square and with a capacity of up to 8,000 sheets paper this is one great machine! After loading is completed the aligned stacks are clamped in just seconds. Place the clamping bar on top of your paper, slide the self-locking, quick-release clamps down to the bar and tighten the screws. The turn the table around and remove the plate for complete access to your padding. The Handy-Padder has an extended sheet metal stabilizer designed to eliminate tipping problems when loaded with stock. If you have any questions or are interested in purchasing the Challenge Handy Padder, visit us at SpiralBinding.com. We have great pricing on a full line of Padders. Call us at 1-800-631-3572 for more information!